The Barlow family purchased The Bike Shop in 2001 from Bob Clammer. The Bike Shop has long been a part of the Barlow family. Phil and Paul spent a lot of time there when they were young kids checking out the latest arrival of BMX bikes. They would often talk to Bob about purchasing the shop, and Bob would say, “Some day boys, I’m going to sell this shop to you”. As the years passed and bicycles were purchased by Paul and Phil as well as for Paul’s two young boys, the opportunity to purchase the Shop finally arrived. In the Fall of 2001, during one of Phil’s visits to chat with Bob, he came home and said “Bob is ready to sell The Bike Shop, are you interested Mom and Dad?” As a family they discussed this opportunity further and decided to buy the business with Phil as the general manager and the rest of the family helping out. The four original owners were Mom/Shirley, Dad/Clyde, and the bicycle brothers Paul and Phil. The whole family was so excited to be able to fulfill Paul and Phil’s childhood dream. This journey they embarked on has taught them a lot about the wonderful community and connected them in ways they never thought were possible. In 2002, the Barlow family had the extraordinary opportunity to build a USA BMX sanctioned track in Saint Helens, and hosted the first sanctioned race on August 4th of 2002. They still look forward to the beginning of each race season in the spring. The Barlows continue to strive to continue the legacy Bob left them of always greeting everyone with a friendly smile, going the extra mile when someone is in need and creating an atmosphere that is welcoming to all. Barlow Bikes & Boards also sponsor Cycle Columbia County, where Paul serves as the race director. Paul was also featured in an article on I Am Athlete. 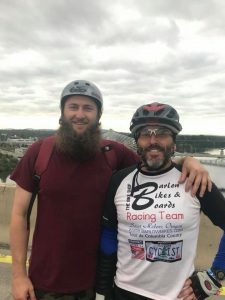 The Barlows have always been an integral part of Columbia County, from the BMX track to hosting the “Last Stop” of the Seattle to Portland Bicycle Race in Scappoose, OR. December 2018 marks the 17th year the Barlows have operated the shop. The general manager is currently a third generation Barlow, Paul’s son Jordan Barlow. Jordan started managing the shop shortly after his Uncle Phil unexpectedly passed away in 2011. Keeping the business a family operation, Paul Barlow, serves as the Chief Financial Officer of the company. For a short time, Jordan’s brother Jared Barlow assisted him in operating the shop until he went to work in the carpenter’s union. Since then, Jordan has been the general manager. Over the last 7 years he has implemented many important changes to the business and is also the lead bicycle mechanic. To meet the friendly staff of Barlow Bikes & Boards, make sure to come in and visit. Also be sure to follow Barlow Bikes & Boards on Facebook, Instagram, and Twitter!